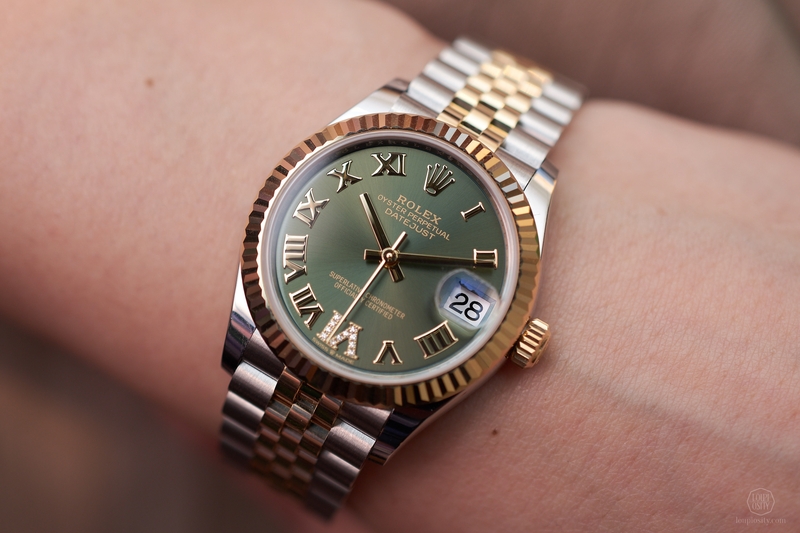 Standing tall at its signature Baselworld spot Rolex brought exactly what the company is a master of: consistency. No ground-breaking novelties this year, instead fine tweaks in shapes and details characterise the 2019 portfolio. The annual astounding and divisive surprise was a richly decorated Daytona. We visited Rolex in Basel. 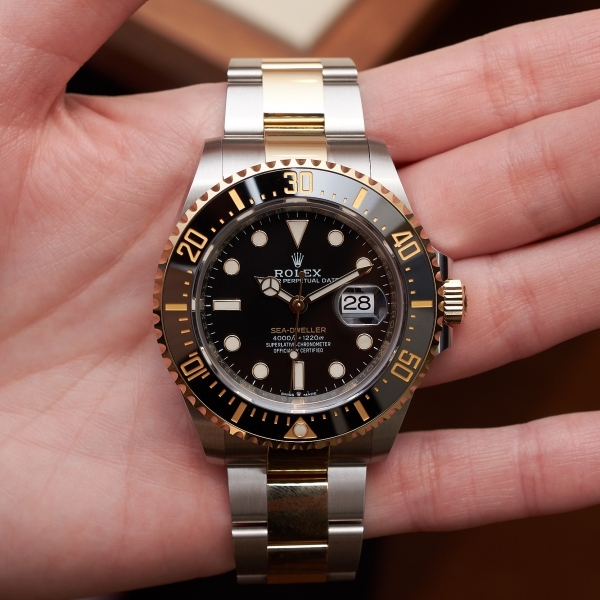 Like it or not, but Rolex has a special role in the world of watchmaking. The brand they build with every move (or by not moving at all when we would expect), the stability they project and the portfolio they cherish make the green-gold castle one of the most hype places at the Basel fair. The intersection in front of Rolex and the catchment area of the booth windows are probably the busiest places in the whole Messe district. People stare at the lit up windows with excitement like families and friends did at the single television in the whole residential block when they appeared during the 50s. This was true when Baselworld was at its peak as well as today, which many describe as a transition period. I would love to see a heat map of the circus one day. So, the increasing outcry from the exhibitors, the media and the public fuelled by negligence of organisers to listen have resulted in an edition in 2019 that is certainly searching for its role in the second decade of the new Millennia. Well, Rolex is not. They stood tall and gave every knight riding in the castle a massive white paper bag, which kind of replaced the white-green tones of the missing Baselworld lilies at the sunlit Messeplatz in 2019. 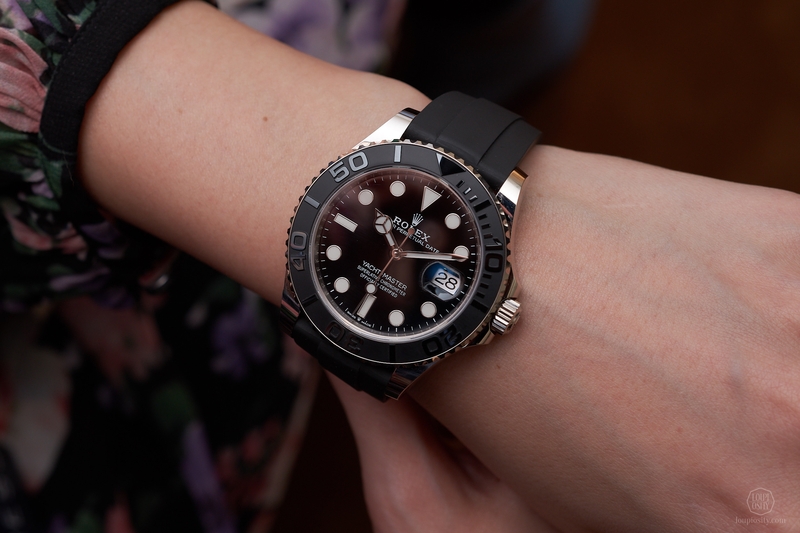 Watch departments at Rolex have perfected the existing portfolio for this year. 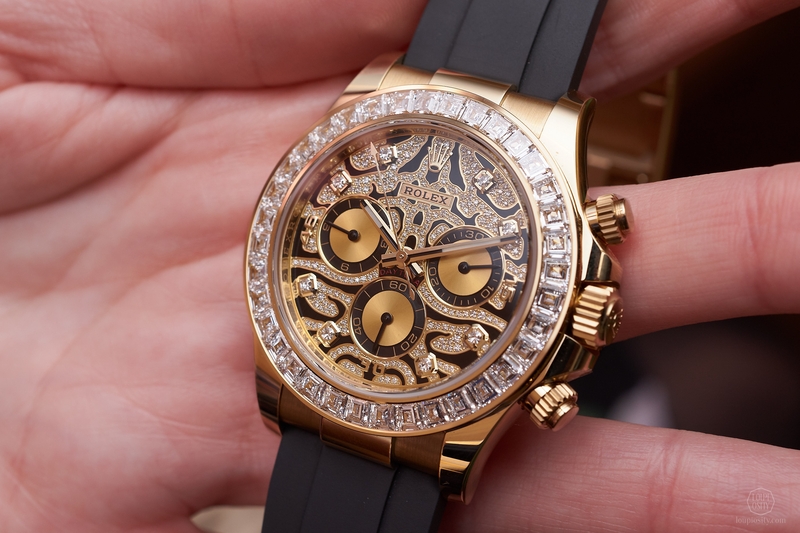 No massive hits, but variations and fine-tuned lines of the well-established models with an extravagant Daytona glued the crowd to the shop windows. Rolex has a strong relationship with yachting sport and with important yachting events. 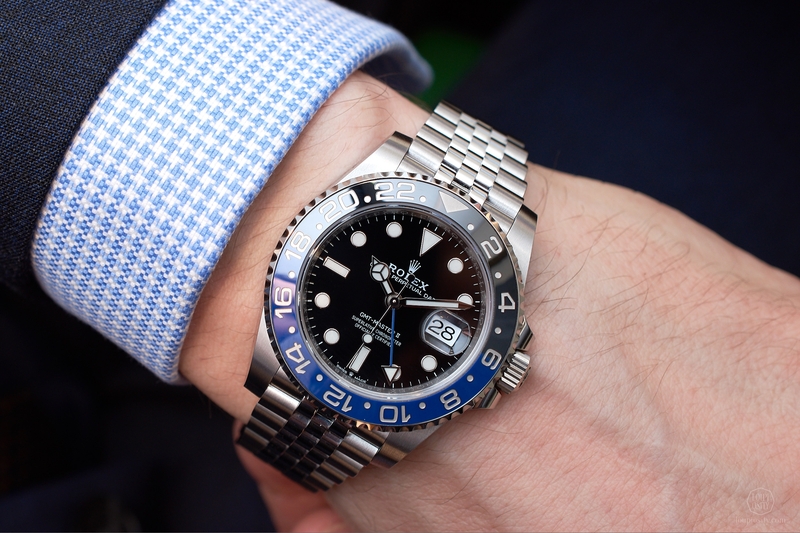 Rolex has deep-rooted ties with the most prestigious yacht clubs, institutions and races all around the world and in 2018 the brand celebrated the 60th anniversary of its association with yachting. The Rolex Oyster Perpetual Yacht-Master, their dedicated line is ‘the watch of the open seas’, as they call it. The recent edition has a 42mm white gold case with a bidirectional rotatable 60-minute graduated bezel and matte black Cerachrom insert in ceramic. The dial is also black ceramic with hands and hour markers treated with Chromalight. 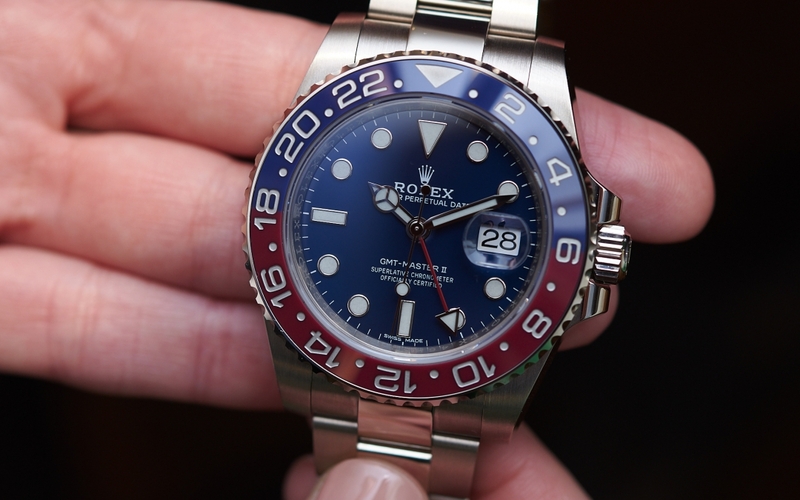 Rolex introduced the blue Chromalight on the Deepsea Sea-Dweller back in 2008. According to the brand this blue glow lasts up to eight hours with a uniform luminosity throughout. 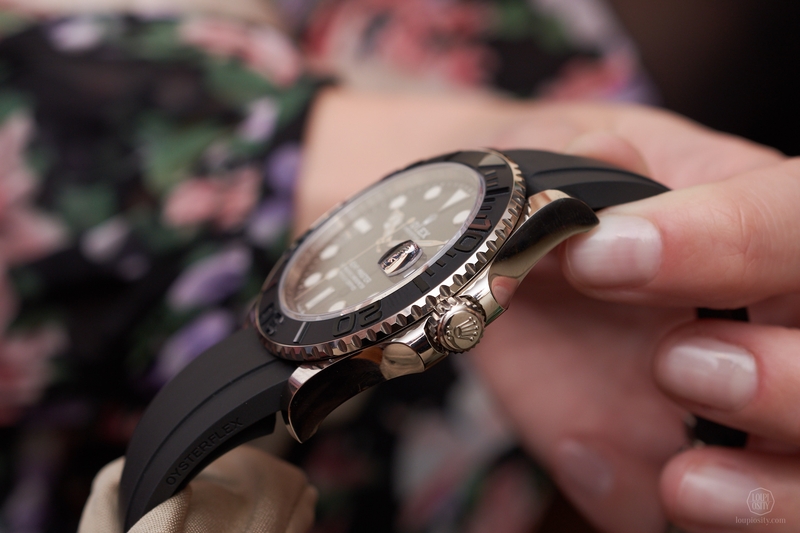 The new model has the Oysterflex bracelet, developed and patented by Rolex (and presented in 2015 on the Yacht-Master). Inside the bracelet you can find a patented longitudinal cushion system that stabilises the watch on the wrist, but at the same time it is really flexible, making the watch light to wear. Developed for challenging environments, the bracelet is extremely robust and resistant to physical impacts. The case is waterproof guaranteed to a depth of 100 metres. The timepiece received the new generation automatic calibre 3235 with Rolex’s Chronergy escapement introduced in the 41 Datejust pieces in 2016. This calibre is featured in a Yacht-Master for the first time. 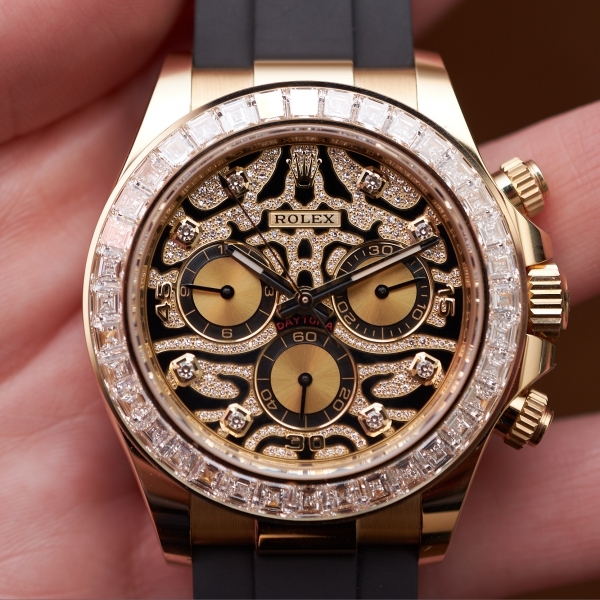 I’m a big fan of the Stella dials – as Rolex aficionados would call some special watch faces. These emerge at auctions on a regular basis. Some with a wooden dial from the 80s or colourful hard-stone dials such as lapis lazuli, onyx, green jasper, malachite, red agate, which are mainly from the 70s. At Phillips Watches we see nice examples every now and then – check out these. In Basel, I was delighted by the colourful dials of the Day-Date 36 novelties. The collection includes a novel dial design with a concentric gradient in green or brown, a light pink opal or my favourite a turquoise with yellow gold case and President bracelet. All have the calibre 3255 inside, unveiled at Baselworld 2015. The movement has increased physical performance in many dimensions compared to its predecessor: precision is twice as good as the COSC requirement for chronographs – somewhere between 2-3 seconds +/- a day and enlarged autonomy by 50% to 70 hours. Last year the company updated the ‘Pepsi’ GMT-Master II with the new Calibre 3285 and a slightly modified Oyster case. The new lines are sleeker and the lugs were adjusted to fit perfectly with the Jubilee bracelet. The updates have been applied to the ‘Batman’ blue-black colour combo this year. The Jubilee bracelet sits very comfortably on the wrist and is equipped with the Oysterlock safety clasp. 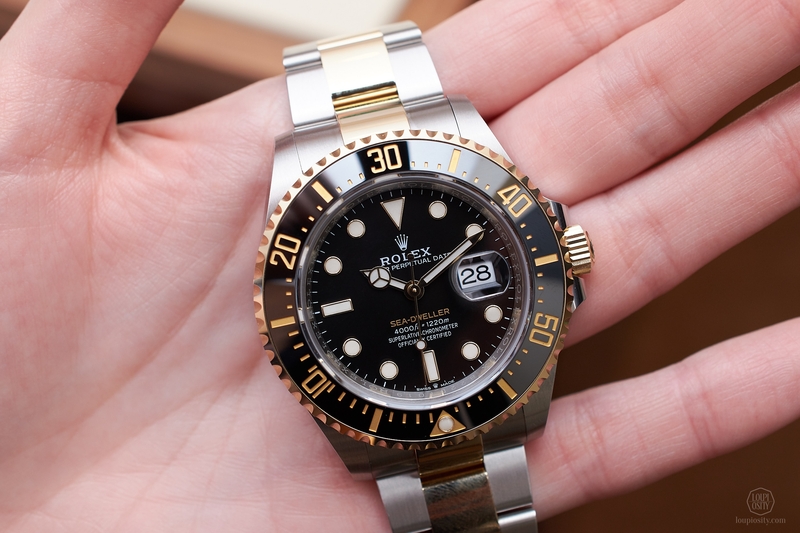 Rolesor is the term Rolex uses for the two toned steel – gold watches. 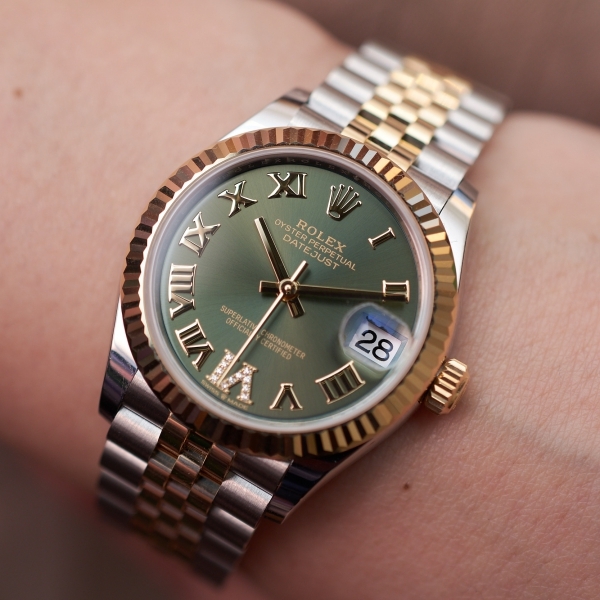 The bezel, the crown, the case and the bracelet may appear in various combinations of these metals. 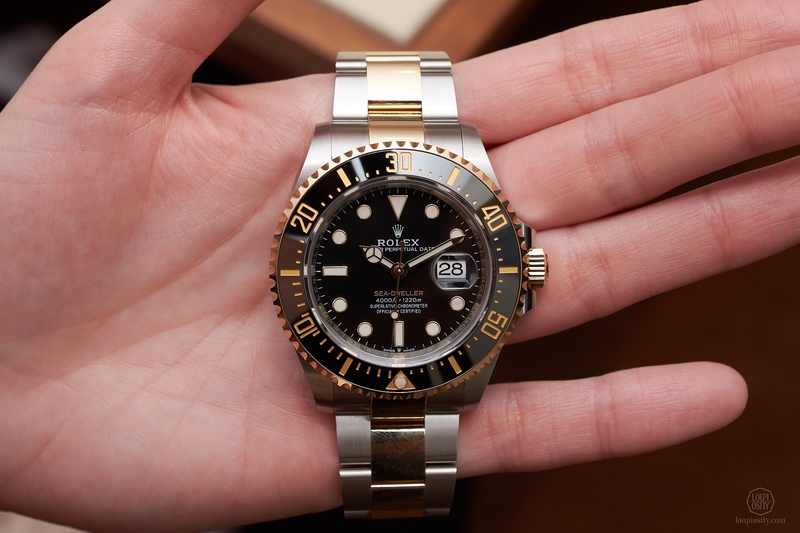 It is the first time they issued a Rolesor version of the Sea-Dweller which received an 18k gold crown and bezel with gold coated recessed numerals and graduations. There is a black Cerachrom ceramic insert on the bezel. The case and the external links of the bracelet are made of Oystersteel. It is rather normal of Rolex to come out with astounding pieces that receive a storm of comments on the social channels. In 2019 a sparkling new Cosmograph Daytona (Ref. 116588TBR) has seen the light with a complex pattern of black lacquer and diamond whirling around the champagne-colour chronograph counters. 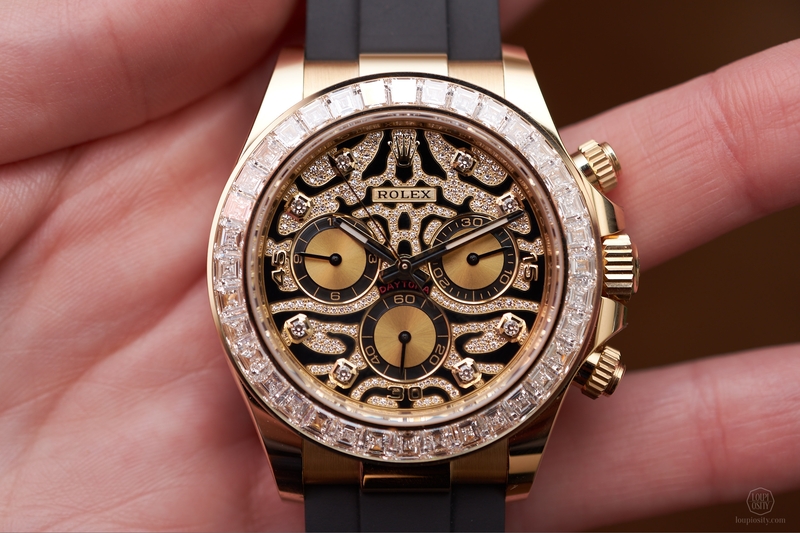 Trapeze-cut diamonds sit on the bezel and the case is made of 18k yellow gold. The not-everyday piece is fitted with a black Oysterflex bracelet and an 18k yellow gold Oysterlock folding safety clasp. Inside beats Rolex’s automatic chronograph Calibre 4130. 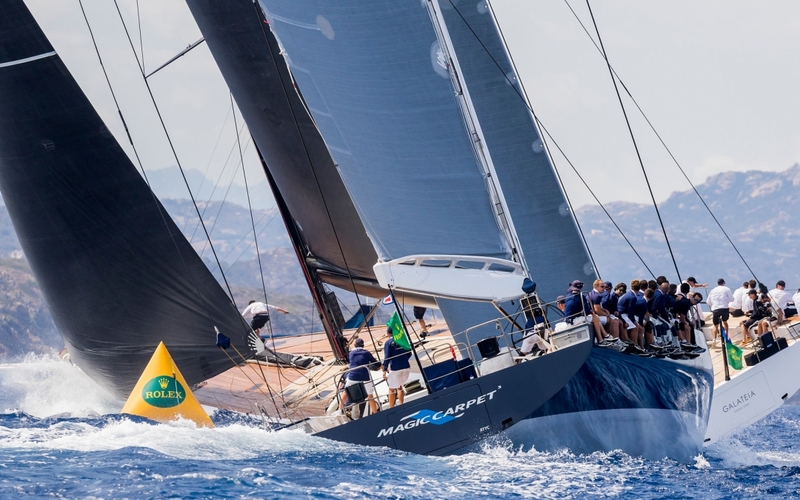 Maxi Yacht Rolex Cup 2018 The Maxi Yacht Rolex Cup 2018 will pitch some of the world’s most imposing yachts in close competition on the spectacular waters of the Costa Smeralda from 2 – 8 September. 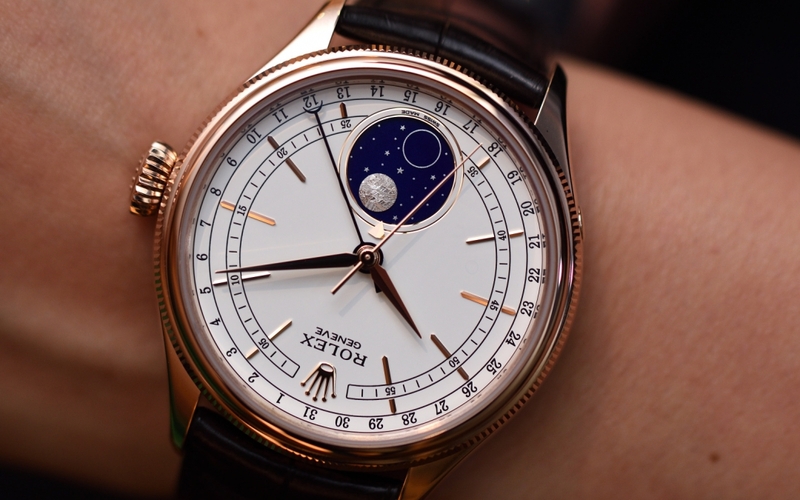 Rolex at Baselworld 2017 Rolex surprised us with the long neglected moon-phase complication in the Cellini line, celebrated the 50th birthday of the Sea-Dweller and added new variations to other Oyster Perpetual models too. 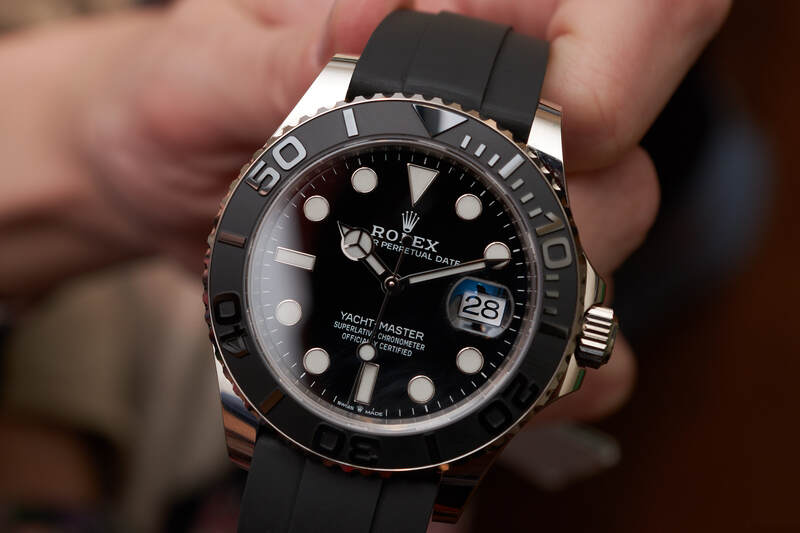 Rolex GMT-Master II – Baselworld 2018 Among other new timepieces, the 2018 edition of the GMT-Master II came in a ‘Pepsi’ colour combination and a brown-black ‘Root beer’ version, but the real novelty was inside, the calibre 3285. In this article we focus on these.